TFW2005 is happy to share a full high res gallery of the latest Masterpiece figure - MP20 Wheeljack! MP-20 is a faithful modern interpretation of G1 Wheeljack, complete with his Lancia Stratos Turbo vehicle mode and appropriate racing decals on top of an Italian themed red, green and white paint job. He stands in line with the Datsun brothers and Sideswipe, adding to the roster of re-imagined G1 / Diaclone era cars and has similar transformation notes with his G1 counterpart - but of course updated with modern, more complicated engineering. Overall he's a great piece, head on over to the gallery and check it out for yourselves! Comparison shots with previous versions and the exclusive coin and Hypnosis Device come from fellow 2005 Admin Sol Fury! Transformers: Age Of Extinction Home Release is out now in Blu-ray, Blu-ray 3D, DVD and Digital HD. To celebrate the release of the 4th installment of the movie, the TFW2005 Staff Members have submitted Accolades to appreciate AOE. Mad props to Superquad7 for his awesome work with the Accolades Poster. This is why he is always Super. At the same time, we thank our dear members for submitting news and info since the very first day of Age Of Extinction principal photography. Also, it was wonderful to read all the awesome movie discussion threads; where some even nearly ended with murder, had we not intervened. First Look at Robots In Disguise Grimlock Toy? Thanks to Grimlockimus we may possibly have our first look at an upcoming Grimlock figure from the new Transformers animated series, Robots In Disguise, which take place after Transformers Prime. Grimlockimus found the image on the new Transformers: Age Of Extinction Blu-Ray special feature section that goes into the development of the toys. With New York Comic Con just around the corner, keep on eye on the front page while we bring you the latest news on the new Robots In Disguise TV show and hopefully, its toyline. Win a Copy of TF:AoE Signed by Mark Wahlberg from TFW2005 Now! The fine folks over at Paramount have given us a Transformers Age of Extinction prize pack to give away to the fans! We are holding a simple contest in order to get the goodies to you starting NOW! Post in this thread on the 2005 Boards, explaining what your favorite moment from any Transformers Movie was, and why. We will randomly choose one grand prize, and two runner up winners from the list of members who participated in the thread on Thursday 10/2. We will collect your information via PM on the Boards, and send it over to Paramount reps who will ship the items directly to you. 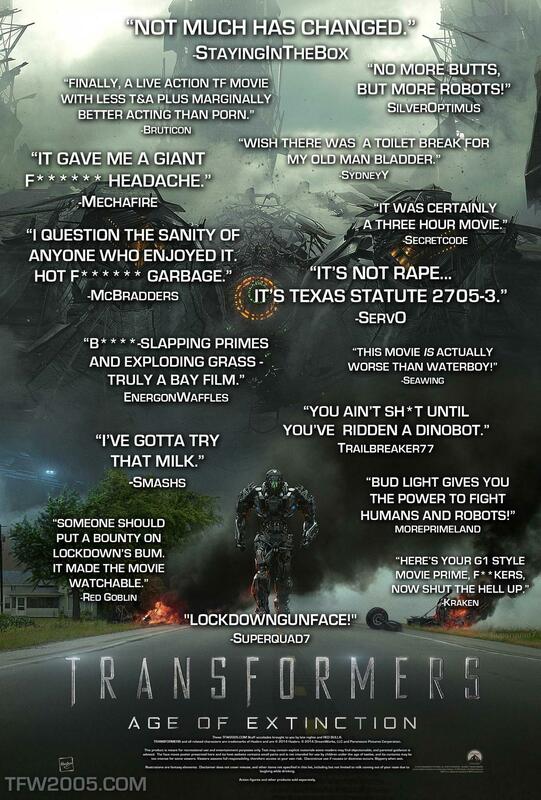 Transformers Age of Extinction is out now on (Blu Ray), (DVD), and Digital HD (via iTunes and Amazon). Make sure to pick up your copy today! Kaiyodo, the makers of articulated action figure line Revoltech, is re-issuing popular figures from it's past in a line called Legacy of Revoltech. In that line, they have included their Optimus Prime, aka Cybertron Commander Convoy. LR-008 is out now and 2005 Boards member BladeStorm picked him up and shared some pics. The figure is otherwise the same as the original Revoltech Optimus Prime with a more purple shade of blue on the boots and helmet. Check it out after the break! Independent group Play With This Too, the company started by several former Hasbro employees, provided an update to their first pair of figures, this time we are introduced to Desolataur. So far we have a design layout of this monster figure and a confirmation from Play With It Too's website that Desolataur "will feature the same articulation as our other characters and also come with a Tech Drone." The concept of spacemen vs monsters continues to remain in play, which was the main model of the 1988 Pretenders series of Transformers. We may be reading too much into this being the Transformers fans that we are, as there have not been concrete homages connected to these original designs. Also interesting to note in this latest round of updates is a little background for the toy designers of this company, specifically regarding the head sculpts which will be made available in three packs: "Along with our figures, we’ll also be offering sets of three heads. These heads work with most 6″ action figures – not just figures produced by PWTToo. We’ve given our designers free range to create what they want to create. “After years of working for huge micromanaging corporations with lots of unnecessary oversight where designers are told what to design by marketers, non-product purchasing focus groups and huge brick and mortar stores, our designers can finally get back to being just that… Creative designers.” – Rik Alvarez" The three head sculpts featured are Terribull, Skull-FCKR, and Madwing, designed by Steve Redinger. Check out the latest round of updates after the jump and continue the speculation about this new company's toy line. Hat tip to TFW2005 member almightymaximus for letting us know about the Angry Birds Transformers Jenga Galvatron, Lockdown, Soundwave and Heatwave being spotted at a Walmart in Connecticut. This is our first reported sighting of the toys, which is sort of a crossover of a crossover combining the game Jenga, Angry Birds, and of course Transformers. Good news for the collectors wanting to add to their Autobot ranks, the Generations Protectobots Emergency Response figures are available to order off of Amazon. The set of five figures comes in two multipacks: a 2-pack with Hot Spot and Blades and a 3-pack of Groove, First Aid, and Streetsmart. Both sets are priced at $32.99 USD and are slated to be released tomorrow, October 1st. Who's getting them? Sound off after the jump. "Hello ladies an gentlemen, today I am very proud to present a GCI original product, G1 Style Cannons for MP Wheeljack. These cannons are designed by TFW2005.COM's very own ATP Designs and will be produced in black resin by Froggy. These will be a The Chosen Prime exclusive and the prototypes will be on display at his booth at TFcon Chicago. Jack's Cannons release date is set to December 15 and will retail for $39.99 for a pair and the "wing" clip. You can jump to the preorder here: Guild of Concoctionous Intent - Jack Cannons"
Notably, GCI is owned and operated by TFW2005.COM's members Megatron31 and Dr. Killinger, who not only make their own projects, but also continue to add contributing TFW2005.COM Customs and Fan Art artists to their projects, as evidenced in the release above. Both of these members are long-time contributors to our Radicons Customs, and you can see their work and the work of many others in our Creative Forums here. What do you think of these? Be sure to jump in the discussion and share your thoughts! The Sentinel Transformers Optimus Prime pen has now been released in Japan. This transforming pen is a cool novelty item with a truly excellent look to the little Optimus Prime's robot mode. Check out these in-hand images, which come from a number of sources including Ci Chan, 北马伊斯力 on Weibo, and Oscar Fung. The Super Festival 66 is currently taking place in Japan, and via Taghobby, we can share some images of upcoming Transformers toys which are on show there. First up are the Million Publishing exclusives, Shouki and GoShooter, who are mail in exclusives for Transformers Generations 2014 Volumes 1 and 2 respectively. They are homages to characters from Headmasters and Masterforce, the Japanese Generation 1 shows, and both feature Mini-Con / Targetmaster partners. Next up are a couple of new images of the fourth set of Transformers Cloud releases. For the fourth releases in the Transformers Cloud line, Generations Roadbuster is getting a repaint as Energon Ironhide aka Super Link Roadbuster, while Generations Sky-Byte is sporting a Skywarp redeco as Hellwarp. Check out all the new images attached to this post. Check out the new images of all of these after the break, courtesy of Autobase Aichi on Facebook. Via Autobase Aichi on Facebook we have a reveal of what seems to be a new licensed Transformers figure from the 54th All Japan Model & Hobby Show. This figure, named "Z Prime", does not homage an existing Optimus Prime design - rather, it is a redeco or retool of Kotobukiya's A03 Type K Z Knight figure. From the image we can work out that this figure mostly seems to be a straight-up application of Optimus Prime colors onto the Type K figure (we can't tell if the head is different as the forearm is in the way, but we think it's the same between both versions). There's some new tooling though, as Z Prime comes with a Matrix. There's no word on if Z Prime will feature the sword and shield of the original release. This figure would seem to be a crossover between Transformers and an obscure offshoot of Tomy's Zoids line, called Z Knights, from the 1990s, which took the Zoids model kit formula and applied it to bipedal robots patterned after warriors of various cultures around the world. No word on a release date for this one yet - so keep it TFW for more news and information on this release. You can check out more images of the A03 Type K Z Knight, which this new Prime is based on, over at HLJ to get a flavor of what to expect from this release. Third party garage kit company Renderform have also announced that they will be making a series of heads for the FansProject Code (aka Chromedome) and Smart Robin (aka Brainstorm). The heads are based on the More than Meets the Eye comic artwork and do not transform - they do however stow in the alt-mode cockpit and they look sharp. There are a series of different heads available to suit all tastes. The Code head "Chromey" comes in both modern and "retro" versions, the latter being inspired by the look of Chromedome in the Shadowplay arc. Both of these heads have a choice of painted or translucent yellow visors. The Brainstorm "Stormy" heads are also available in multiple versions, with painted or translucent eyes in both blue and yellow on offer, four versions in all. Red and silver "Virus" versions of all three heads are also going to be released, in limited numbers. Check out the Renderform homepage for more information! Hisashi Yuki has shared a real blast from the past on his Twitter account, TFYuki. He's posted up some of the original pen concept sketches for Beast Wars Second Galvatron. Beast Wars Second (or BWII as some know it) diverged from the US Beast Wars continuity and introduced a host of new characters. Galvatron was the Destron leader in this series, a triple changer who possessed dragon and drill tank forms. These sketches show the earliest ideas of Galvatron, from the first concepts that Galvatron with the drill as one of his arms to the finalized design. Check them out attached to this post. Hasbro and Toys R Us in Canada have partnered up to offer the Elite Optimus Prime Kre-O figure as a "make and take" exclusive. The set offers a Kreon Optimus Prime at its core with lots of parts around the edges to "bulk up" the Kreon into a larger buildable figure. The event is running in Canadian Toys R Us stores on the 27th of September - that's today folks! Be sure to head over and check it out. Thanks to the official Transformers Facebook page for the heads up. Board member and Renderform extraordinaire, Venksta, gave us an update on some add-ons for the Fansproject Steel Core figure. You can read his update after the jump as well as view the images of the head mirrored to this news post! "Originally presented at TFCon 2012, the Renderform Iron Magnum and Steel Magnum heads are up for preorder. These heads are for Fansproject's Steelcore figure! The heads are inspired by the Armada Overload/Energon Ultra Magnus, which many people felt initially was the homage that Steelcore was based on. The RFX-009 Iron Magnum head is based on the original prototype design shown off at TFCon 2012. While the RFX-008 Steel Magnum is based on my custom head design. Both heads are available in Steel Core colors and Energon Ultra Magnus colors. The Steelcore colors are limited to 150 sets each, while the Magnus colors are only 100 sets each. Also available is the RFX-009R Red Sentinel kit, which comes with a metallic red Leo Justice Sword. This head is based on a concept design I did, which the Steel Magnum head is based on. Its also intended to create a new variation and look, when you swap the Steel chest for the upcoming Soleron Ruthen from the FPCore.com membership! This set is limited to only 50 pieces. I included a CAD mockup of how the Red Sentinel will look like with the Steel Core and Ruthen combo, below. RFX-008 Steel Magnum and RFX-009 Iron Magnum - Renderform.com"
Toy Stages - Official Product and Site Launch! We've got some really exciting news for those of you who really enjoy additions to a collection like displays, dioramas, and backdrops! Reprolabels.COM operator and one of the founding members of our own Radicons forums, Delta Star, dropped by to give us this press release launch of a new venture - ToyStages.COM! "Toystages.com produces backdrops for toy collectors. They're great for photo shoots and permanent display. A new section has been added with several backdrops aimed at the Transformers collector! Also, they will be displaying the large backdrops at Action Figure Expo this Sunday in Mississauga, so if you're in the are, go and have a look!" For those of you who have been waiting....it's here. Thanks for your patience! Release date is October 7th. It's been a pleasure putting this together with the fine folks at La-La Land Records, big thanks to them. My homework assignment for this weekend: finish signing a couple hundred copies, which will be available on La-La Land's website as well as a handful of randomly signed ones going out to whatever places still sell CDs. So if you get a copy that has some weird black scribble on it, that's probably my signature. As always, thank you everyone for all the love and support. You guys are the reason I pushed to get this out. More Transformers Game News. Jagex has released two videos showcasing the Autobot and Decepticon sides of the story for Transformers: Universe. Will you side with Optimus Prime and the Autobots, or lust for power with Megatron and his Decepticon army? That choice is yours in Transformers Universe, the next evolution in MOBA gameplay. Now is the chance to enter the fray in this explosive PVP combat game packed with killer team combat. Join the war against the Decepticons and ally with Optimus Prime to defeat the tyranny of Megatron! Join the war against the Autobots and ally with Megatron to achieve Peace through Tyranny!